Each year, the Grand National horse racing event draws an international audience of about 600 million people – making the naming rights an appealing prospect for potential sponsors. The event itself was born out of a sponsorship deal after William Lynn, an innkeeper at the Waterloo Hotel in Liverpool, backed a hare coursing event called the Waterloo Cup in the mid-1820s. The success of the greyhound racing cup led to the leasing of land at Aintree – home of the Grand National – for horse racing events, with the first official race being held in 1839. Since then, it has become a global event, with people from 140 countries tuning in to watch 40 jockeys jostle for first position on a four-mile course with 30 fences. While it’s now a commercial monster, with 12.9 million people estimated to place a bet, it was only in 1984 when the race had an official sponsor – one of five companies to link up with the race to date. Canadian whiskey distiller Seagram was the title sponsor for the Grand National from 1984 to 1991. Ivan Straker, chairman of Seagram UK and horse racing enthusiast, persuaded the company board to sponsor the event in order to save Aintree Racecourse from becoming a housing estate. The final steeplechase race under the Seagram Grand National name was won by a horse called Seagram. The Canadian company was rumoured to have been offered to buy the horse before the race but declined. 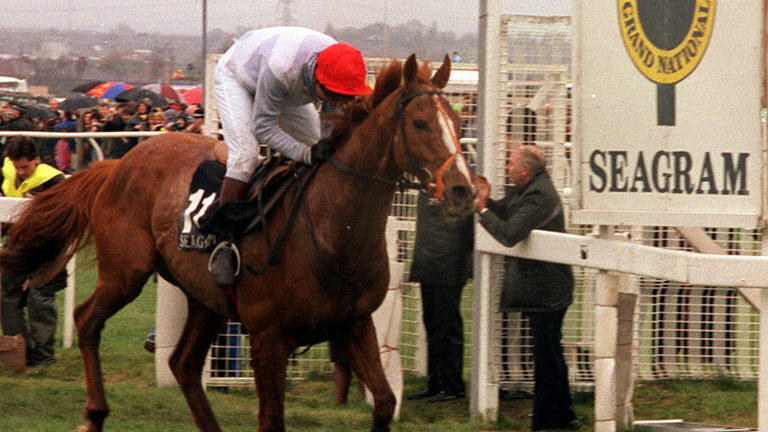 Martell Cognac, owned at the time by Seagram, took over the naming rights of the Grand National in 1992 in a deal worth £4.5m. Founded in 1715, it was subject to a $920m (£703m) takeover bid from Seagram in 1988. Charles Barnett, former managing director of Aintree racecourse, claimed the Martell sponsorship “transformed” the Grand National – taking the attendance numbers from 87,000 in 1992 to 140,000 in 2003. Seagram’s assets, including Martell, were divided between British alcoholic beverage company Diageo and French wine and spirits conglomerate Pernod Ricard – which now owns the Martell brand – in an $8.15bn (£6.23bn) deal in 2000. Tadcaster-based brewery John Smith’s first backed the Grand National in 2005. It produces the highest selling bitter in the UK, and was purchased by Dutch brewing company Heineken in 2008. John Smith’s ended its deal with the race in 2013 due to a combination of commercial interests and the negative press following the death of two horses at the 2012 event. Continuing the trend of partnerships with alcohol brands, Crabbie’s ginger beer was announced as the new sponsor of the race in 2013. The new sponsor raised the winner’s purse to £1m for the 2014 event and was the main partner for three races. The Scottish company decided not to renew its partnership after CEO Stewart Hainsworth decided it was not getting good value for investment from the partnership. Northern Irish health and clinical research company Randox became the latest official sponsor of the Grand National in 2017. Established in 1982, the company specialises in diagnostic technology and tests to identify and prevent heart disease, hormone imbalances and kidney health. Alongside the sponsorship of the main race, Randox Health is also the official healthcare partner of The Jockey Club, which owns 15 racecourses across the UK including Aintree, Cheltenham and Epsom. Randox Testing Services was at the centre of controversy in December last year, when 40 motorists convicted of drug-driving offences were cleared after evidence of data manipulation was found. The police described the scandal as one of the “most serious breaches” of forensic science testing standards and a further 10,000 cases were scheduled to be reviewed.